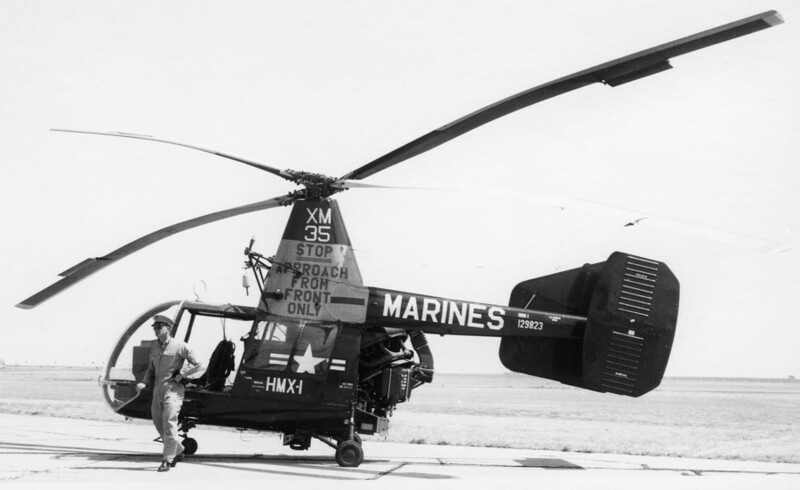 To indoctrinate assigned Marine Corps personnel in the operation and maintenance techniques of the HOK-1 helicopter and its installed and associated equipment. To report operating and major discrepancies revealed during an accelerated flight program. 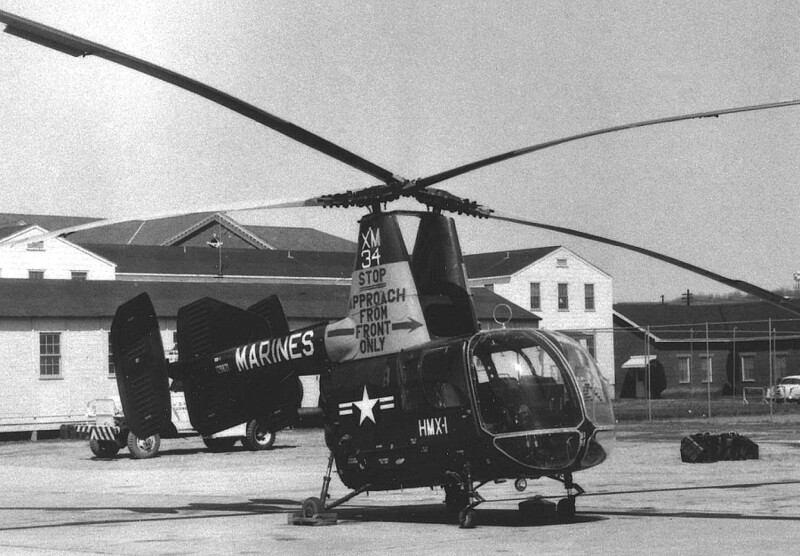 To recommend changes which would improve the operational suitability of HOK-1 helicopters for Marine Corps use. Six HOK-1 aircraft : 129803, 129811, 129816, 129820, 129821, 129823, flew a total of 685 hours during 445 flights , over a period of 27 working days. Rough area famialization, Navigation, Night famialization. The pilots were checked out in the operation of the helicopter and its installed and associated equipment by KAC Test Division, after the initial check out period of flying was done by pilots and crewmen. The maintenance men were checked out by the combined efforts of KAC Service Department, KAC service representatives, factory and instructors and members of KAC Engineering staff. In addition one KAC test pilot was assigned to the project during the entire period. 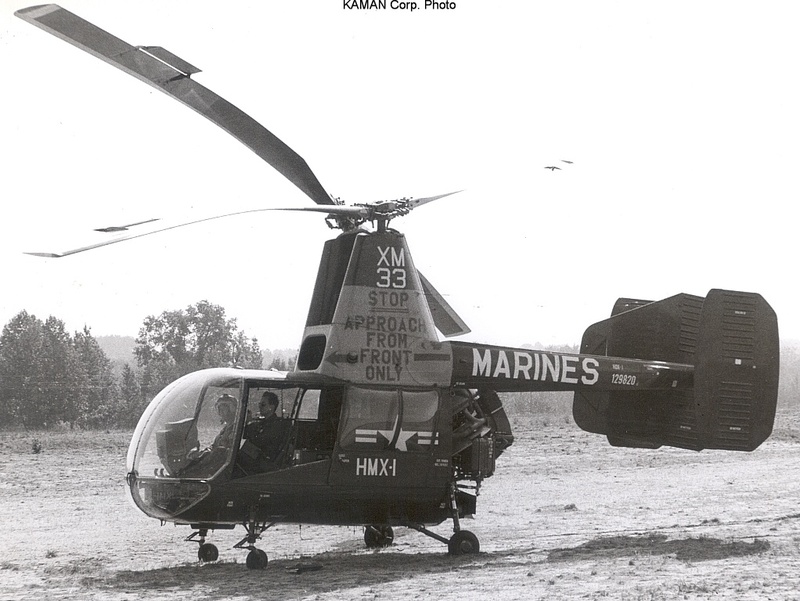 This project demonstrated, that it was feasible to maintain and operate a squadron of HOK-1 helicopters on a schedule comparable to that of a VMO squadron. 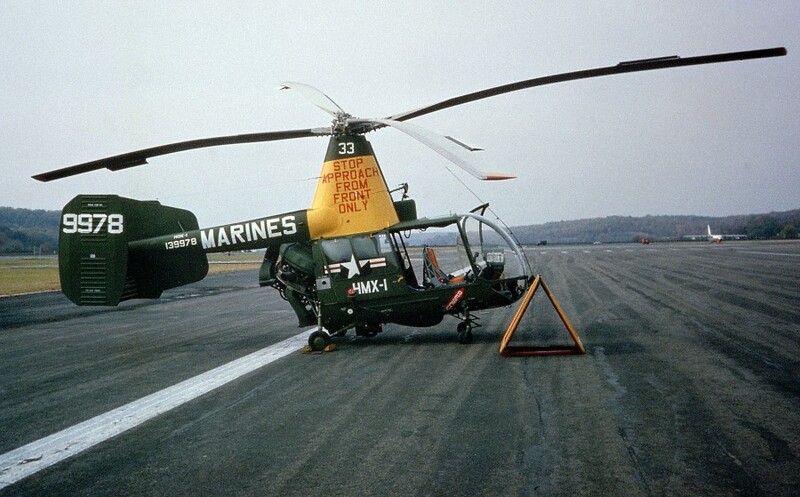 While recognizing certain deficiencies in the HOK-1 helicopter, the consensus of the participating FIP personnel was that it was an improvement over current VMO helicopters. 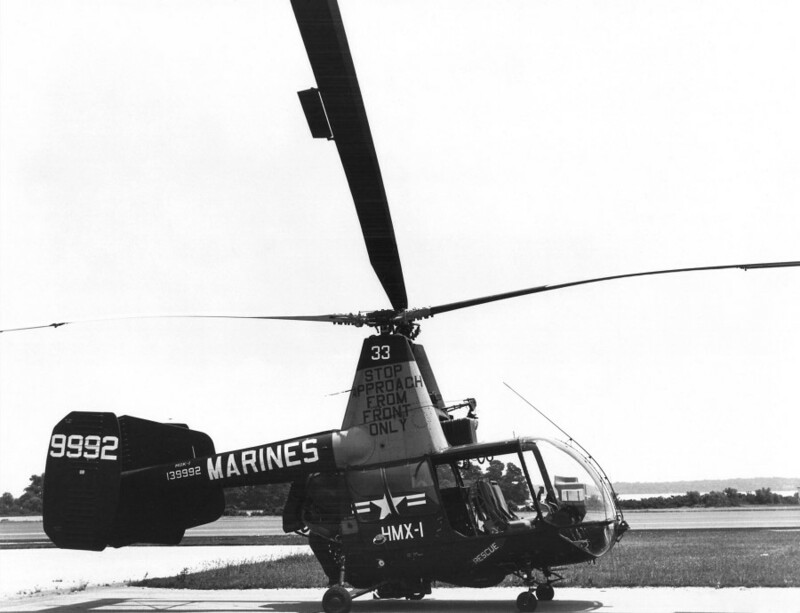 The flight qualities of the HOK-1 helicopter were excellant in winds up to 25 knots and satisfactory up to 40 knots. In gusty winds over 40 knots special pilot technique of all controls, especially the rudder, is necessary. Cross wind landings in fields in winds about 25 knots is not desirable. A feature of the aircraft is that through use of trim tab, control pressure may be reduced to a minimum in all flight conditions. The autorotation characteristics of the HOK-1 are excellant. 2 hours familiarization all pilots considered fully qualified in this respect. HOK Carrier Evaluation Program on board the U.S.S.Siboney (CVE-112) during the period 25 May to 6 July 1956. 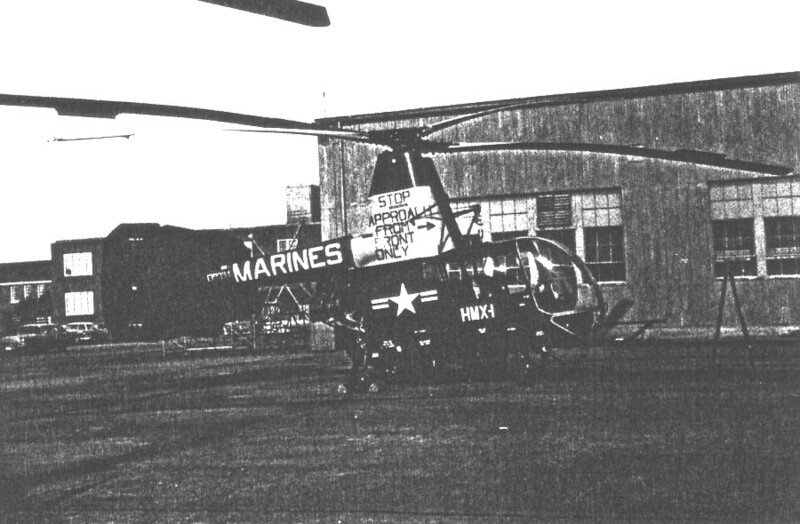 HOK-1 129806 and 129823 (both with HMX-1 pilots and crew) were flown from Bloomfield to Norfolk, VA and landed on board the Siboney. They were assigned as "Angels" for evaluation of plane guard duty and had been modified at KAC to incorporate wide doors, cabin platforms, cargo slings and personnel hoists. On 26 May the Siboney departed Norfolk, VA for the mediterranean area to take part in joint Navy-Marine maneuvers. On 01 June the HOK's were flown from the carrier, which then was near the Azores, for the first time. Flights were made up to 07 June, when the Siboney anchored in Augusta Bay, Sicily. Here, hoist "rescues" were undertaken. On 09 June the carrier anchored in Suda Bay, Crete, Greece - 5.5 hours were flown here as "Angels". On 11 June anchored in Dikili, Turkey and on 12 June the joint Navy-Marine maneuvers began. The HOK's flew "Angels" missions and a Turkish Air Force Major was given a ride in 129806. On 13 June HOK's made night flights from the Siboney. On 14 June the carrier anchored off Izmir, Turkey. The HOKs were shown to 25 Turkish officials. From 15 to 19 June the Siboney was in Athens, Greece. On 25 June the HOK's flew missions while the carrier was at Tanger, Morocco.No further flights were made during the Atlantic crossing back home to Norfolk, VA. 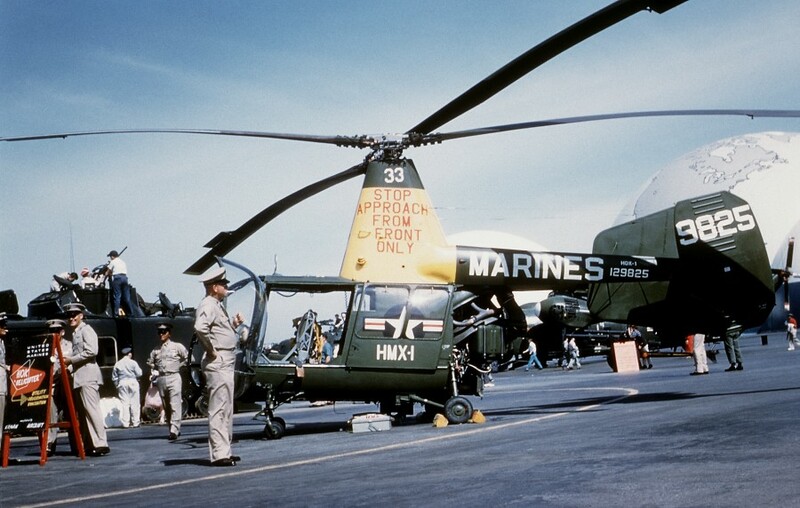 Here, on 06 July, both HOK's flew "Angels" missions and departed to MCAS Quantico, VA.
129820 19 Jan 1956 - 05 Jan 1959 "XM 33" 129825 06 Jan 1959 - 13 Sep 1961 "33"
129806 25 May 1956 - **18 Oct 1956 139992 12 Oct 1961 - 26 Jun 1962 "33"
139994 17 Oct 1957 - 27 Feb 1958 139978 12 Oct 1962 - 08 Jun 1963 "33"
129813 05 Nov 1958 - 16 Mar 1961 "XM 31"